The Rams were the highest scoring defense of the week after their 52-0 rout of the Raiders. If you took my advice, you were rewarded with 29 standard fantasy points. The Rams had 3 interceptions, 2 fumble recoveries, 6 sacks and a touchdown. Oh yeah, they didn’t allow a single point either. The Rams head to Washington to face a struggling Redskins team. Their ownership jumped to 50% last week, but if other owners in your league passed it’s time to make the add. The Colts played Washington last week and although they recorded a solid 11 fantasy points, I thought they would go completely nuts. They scored a touchdown and sacked Colt McCoy 6 times but allowed 27 points. The Texans are used to giving up points on a weekly basis, but this does not stop them from continuing to put up great fantasy numbers. JJ Watt led his unit to 11 fantasy points on the back of a fumble recovery and 3 interceptions. Houston heads to Jacksonville next week, meaning I don’t have to dig any deeper here. You know what to do. I mentioned a couple of the defenses that I targeted last week and how their matchups this week are just as good, if not better than last week. Besides the Rams and Texans, here is another team to look at as we reach crunch time! Minnesota Vikings: Mike Zimmer is a defensive genius. 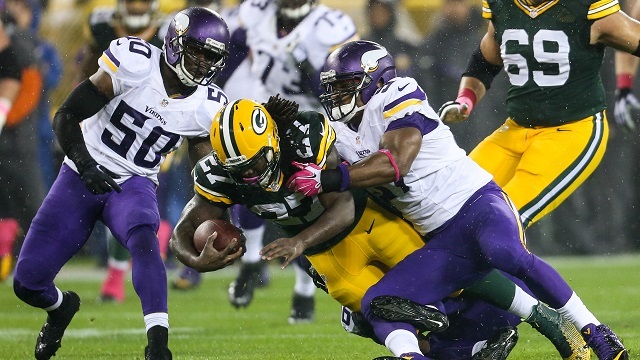 He has turned the Vikings defense from absolutely horrendous to reliable on a week-to-week basis. There are still a couple problems in the secondary but overall this defense is well improved and their fantasy numbers show it. Now they come home to TCF Bank Stadium and get the New York Jets. The Jets are coming off a short week after their Monday night loss to the Dolphins. And yes, Geno Smith is still awful. I’m expecting big things out of this unit in week 14. NOTE: As the waivers come available this week make sure you take a look at the defenses that people are dropping to make room for other players. Many owners stick with one defense during the playoffs and kick the other one to the curb. While many of the defenses with great matchups this week are owned in 75-95% of leagues, that does not mean they are not available in your league. Watch the waiver wire closely this week as we head into the fantasy playoffs. Good luck, and as always, happy streaming!